If I want to vote for Cuomo, which Cuomo do I choose? People seem to be sick of this election. Even though in Schenectady we don’t have a highly visible contested election. Perhaps I’m just oblivious to the election because I don’t watch cable TV, which is a fantastic way to avoid political ads and binge watch my favorite show-du-jour on Netflix. But today is election day, and it’s time to vote. I always make a point of voting in these non-presidential years and any other small election because my vote counts that much more. 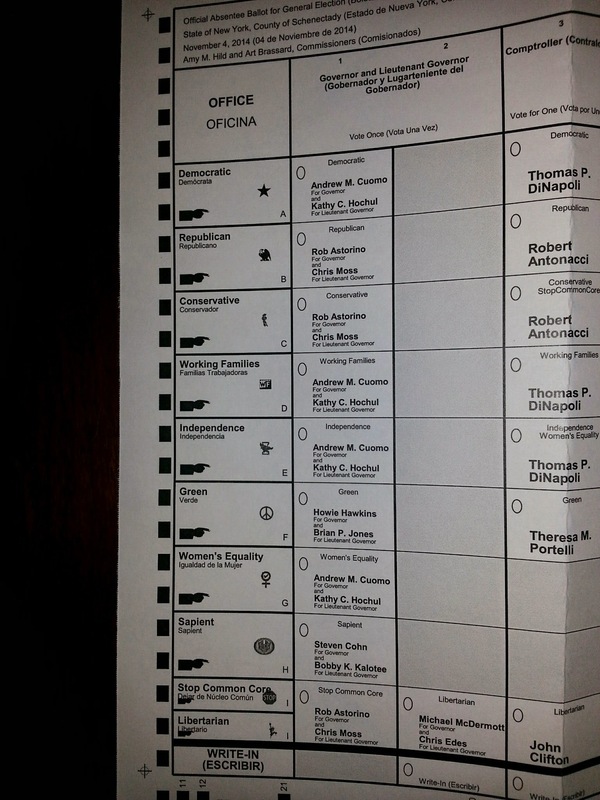 Which brings me to an odd thing about NY ballots…the same candidate is listed multiple times? (at least I was surprised the first time I saw it). Andrew Cuomo is listed 4 times? Rob Astorino comes in second with 3. Even if I know which candidate I’m supporting, how am I supposed to know which candidate to vote for? As an aside, I’m questioning just how real these parties actually are. The Stop Common Core Party? Sounds like a ploy to be listed one more time on the ballot. Apparently, the Women’s Equality Party is equally dubious. I have never voted in a state before where it is important to not just vote for your preferred candidate, but also for your preferred candidate AND party. You see, NY State lists candidates by party by order of votes received in the last Gubernatorial election. Having never voted in a state before that did this, I decided to look into how states vote. 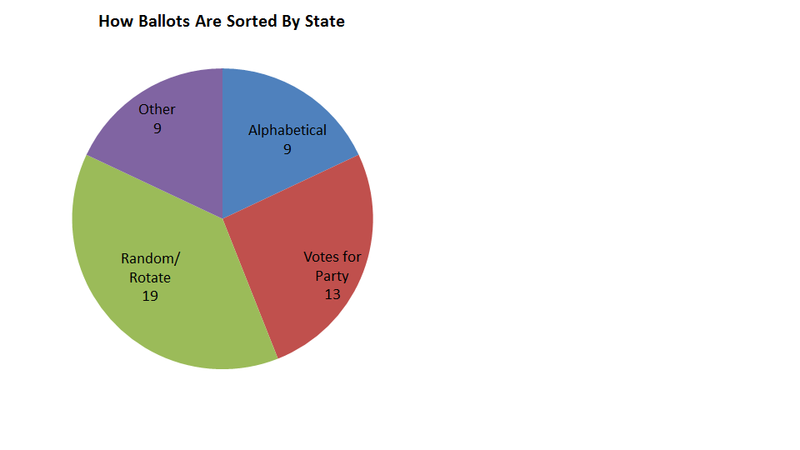 As you can see from the pie chart, the most popular way to sort candidates is randomly (or through some sort of rotation). I was surprised to see how many states sort candidates by party, but perhaps it’s just a format I’ve never experienced before. I would have thought more states would have sorted candidates alphabetically. All the data were taken from this site. The interesting thing is how different each state is with respect to ballot order. As I looked through the list, however, one state stuck out: Minnesota. Sure, they sort candidates by the number of votes a party receives, but they do it in reverse. Imagine a NY ballot with Cuomo and Astorino sharing the spots where the Stop Common Core and Libertarian Parties now reside. Unfortunately, it won’t stop the sort of political games going on in this election where Cuomo is actively trying to remove the Working Families Party from the ballot because they ran Ms. Teachout against him in the primary. At least for those who are tired of this election, after tomorrow it will all be over and all those yard signs will be removed. I can dream, right? When I first heard about NY’s push for hard cider, I was skeptical. My skepticism came from my dislike for what I thought was a typical cider: Woodchuck hard cider. I first learned of this super sweet, syrupy version of hard cider when my college roommate drank it instead of beer. I still find it hard to believe how he was able to enjoy substituting Woodchuck for the watered down light beers typically consumed at college parties. My dislike of hard cider persisted until last week when I finally decided to listen to the hype and try some hard cider from Nine Pin Cider Works. I’m certainly glad I did. I started with the ginger, which was not super sweet and had the ginger heat from great ginger ales. After my surprising revelation that I might actually be able to enjoy hard ciders, I decided to revisit my old nemesis. I tried a Woodchuck Amber, Nine Pin Signature Blend, and a homemade version from one of my coworkers. It wasn’t a scientific double-blind tasting with repeats, but after trying all 3, I reached the same conclusions. While the Nine Pin cider was refreshing, the Woodchuck tasted more like a melted green apple snow cone (I exaggerate a bit; and whether or not you agree with my description, the Woodchuck didn’t get finished). Since my Nine Pin revelation, I’ve tried the Hunny Pear and Belgian varieties, and I can’t wait to try more from their extensive product list. 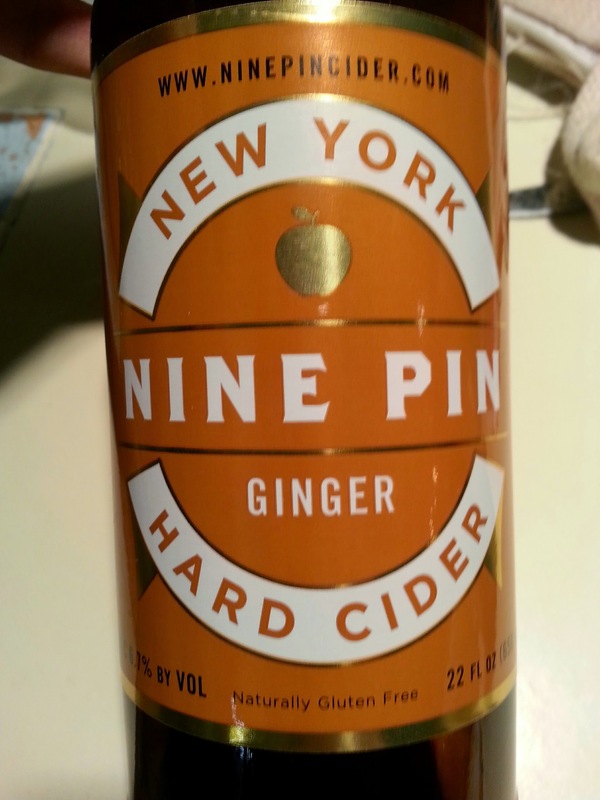 If you have dismissed the hard cider genre like I had, I encourage you to give Nine Pin a try.